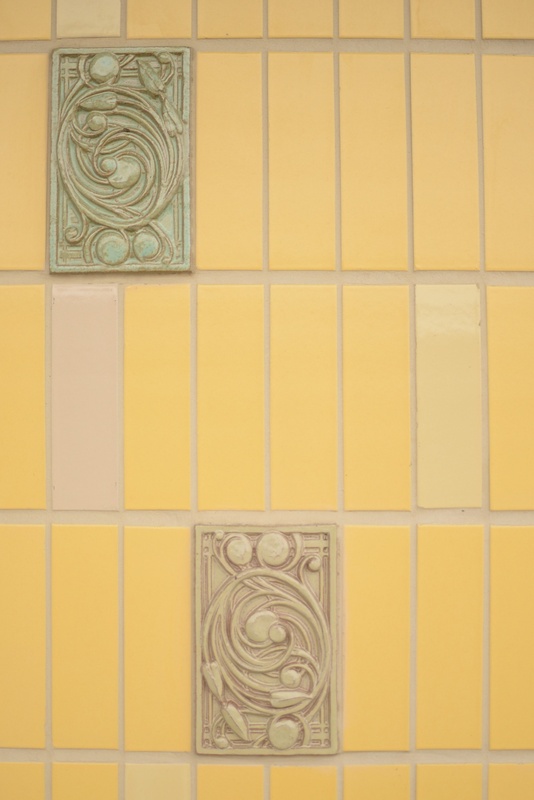 Hand glazed terra cotta tiles of green, yellow, brown and a few other colors with low-relief tiles imbedded in various places. Also includes water-cut stainless steel railings and panels. 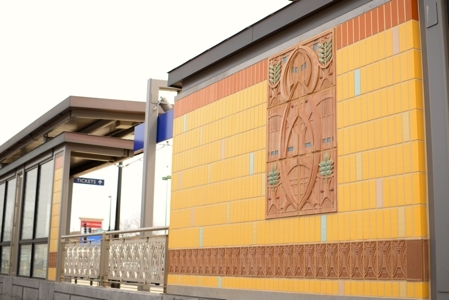 "Hamline Prairie Station" is inspired by Prairie School Architecture and plays on the motifs of regional sources, specifically the work of Purcell and Elmslie. Their domestic and commercial buildings are a “unique expression of the American Spirit” and the Twin Cities were an important part of this movement. 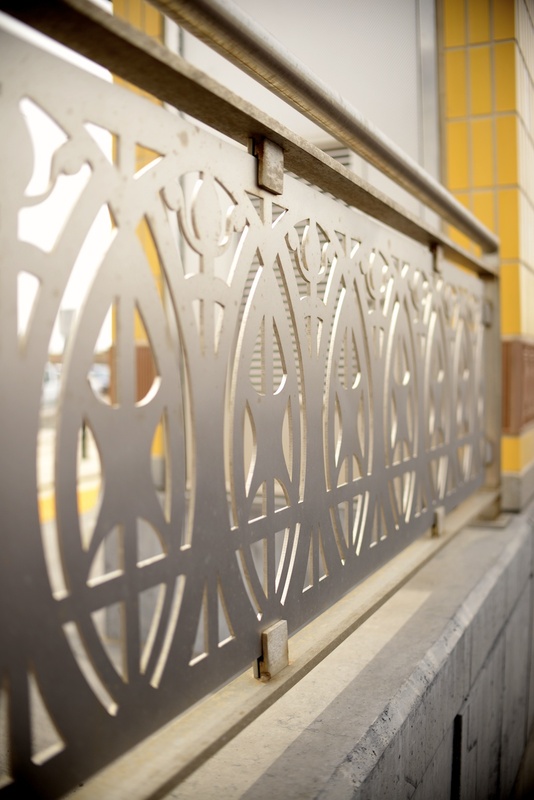 This artist has always been drawn to the combination of geometric and organic forms that define the Prairie style; the station provides a modern context for new designs that are both original and complimentary. 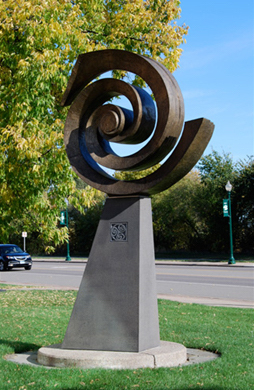 Foster Willey is a sculptor and public artist working in St. Paul, Minnesota, who creates large-scale projects for major municipalities involving architects, engineers, landscape architects, lighting designers, fabricators, historians, graphic designers and conservators. Using the environment as the context for his public art, Willey enriches daily life with sculptural designs, which are supplemented by a process that includes the community voice. “Animating form thru the plasticity of materials and utilizing negative space to express both mass and transparency have been the focus of many of my sculptural investigations.” These formal concerns inform the symbolic content of his work, which often involves the search for an archetypal resolution. 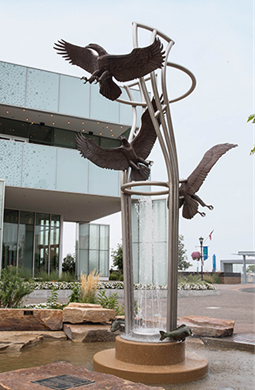 His work encompasses large-scale projects for various municipalities and design settings including commissions in bronze, fabricated metal, pre-cast concrete, terra cotta, and stone. Originally from St. Joseph, Michigan, Foster received a Bachelor of Fine Arts from Grand Valley State University in painting and sculpture. He expanded his education with courses at Michigan State University and Andrews University where his mentor was British Sculptor, Allan Collins. Foster also attended the Naguib School of Sculpture in Chicago where he worked with Egyptian sculptor, Mustafa Naguib. Prairie School was a late 19th- and early 20th-century architectural style, most common to the Midwestern United States. The style is usually marked by horizontal lines, flat or hipped roofs with broad overhanging eaves, windows grouped in horizontal bands, integration with the landscape, solid construction, craftsmanship, and discipline in the use of ornament. Horizontal lines were thought to evoke and relate to the native prairie landscape. 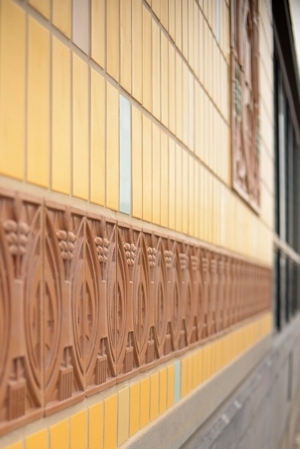 The term Prairie School was not actually used by these architects to describe themselves (for instance, Marion Mahony used the phrase The Chicago Group); the term was coined by H. Allen Brooks, one of the first architectural historians to write extensively about these architects and their work. 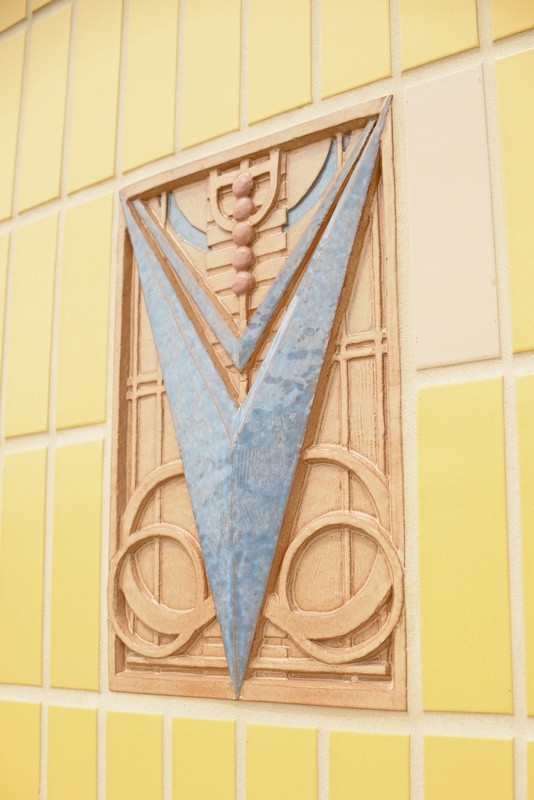 The Prairie School developed in sympathy with the ideals and design aesthetics of the Arts and Crafts Movement begun in the late 19th century in England by John Ruskin, William Morris, and others. The Prairie School shared an embrace of handcrafting and craftsman guilds as a reaction against the new assembly line, mass production manufacturing techniques, which they felt created inferior products and dehumanized workers. The Prairie School was also an attempt at developing an indigenous North American style of architecture that did not share design elements and aesthetic vocabulary with earlier styles of European classical architecture. Many talented and ambitious young architects had been attracted by building opportunities stemming from the Great Chicago Fire of 1871. The World's Columbian Exposition (Chicago World's Fair) of 1893 was supposed to be a heralding of the city of Chicago's rebirth. 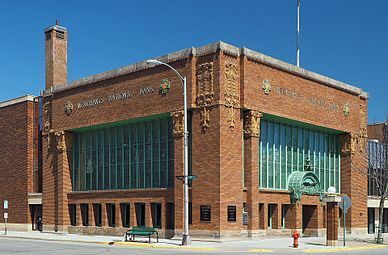 But many of the young Midwestern architects of what would become the Prairie School were offended by the Greek and Roman classicism of nearly every building erected for the fair. In reaction, they sought to create new work in and around Chicago that would display a uniquely modern and authentically American style, which came to be called Prairie. The designation Prairie is due to the dominant horizontality of the majority of Prairie style buildings which echoes the wide, flat, treeless expanses of the mid-Western United States. 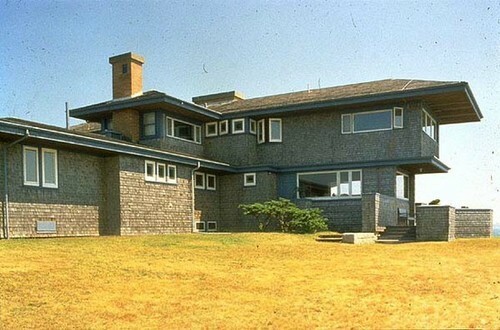 The most famous proponent of the style, Frank Lloyd Wright, promoted an idea of "organic architecture", the primary tenet of which was that a structure should look as if it naturally grew from the site. Wright also felt that a horizontal orientation was a distinctly American design motif, in that the younger country had much more open, undeveloped land than found in most older, urbanized European nations.